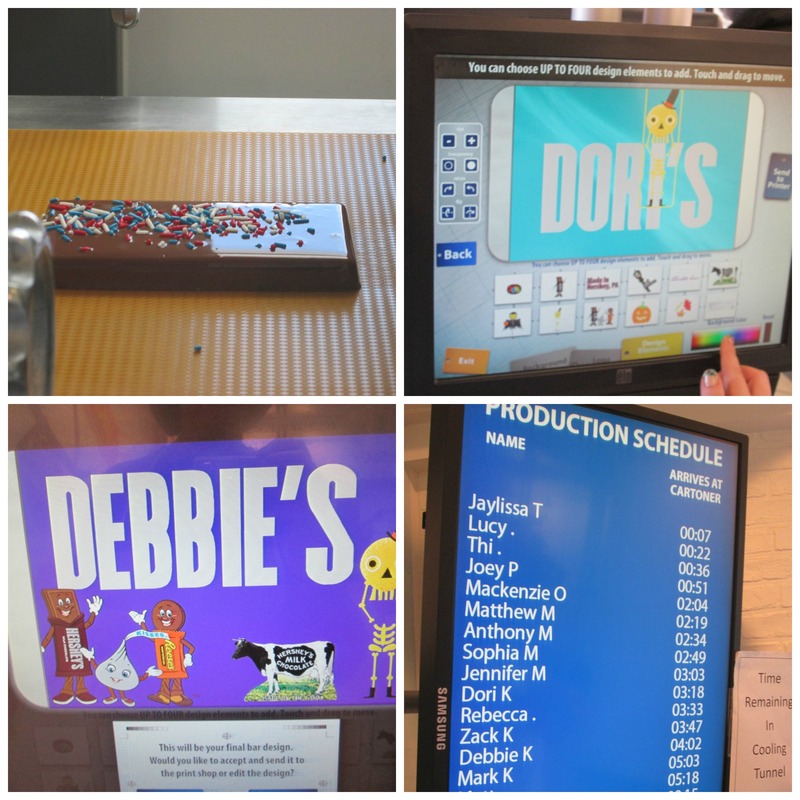 We went to Hershey last weekend for the first time, and I wanted to cram in as much as we could. My husband was running the Hershey Half Marathon, which make planning a little more difficult, so I had to prioritize what we were going to do. I heard about the Hershey create your own candy bar experience, though, and knew that was top of the list. We arrived at the entrance at our appointed time. It wasn’t a formal tour, so you literally just show up at your ticket time. They give you an apron, hair net and if needed, a beard net. 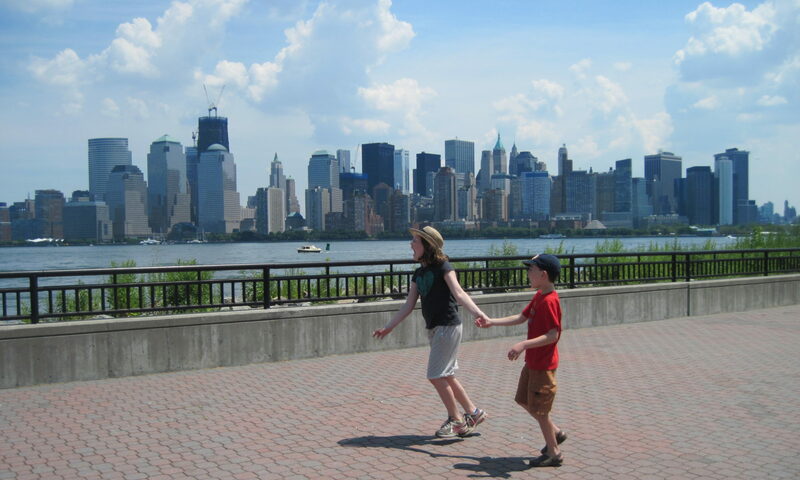 My 12 year old took one of those just because it was fun. Not sure why you need an apron, since you don’t go anywhere need the food. The hair net, I kind of get, even though everything is behind glass. They have free lockers for your things, and a coat rack as well, so that was helpful. Hold on to your ticket because it has a bar code you’ll need several times. You head to a computer screen and choose the base bar: milk, dark or white chocolate. While we were there, I didn’t see anyone choosing the white chocolate bar, which was wise. You then get to choose up to three toppings/mix-ins (though if you choose less than that, you don’t get extra). We could choose crispy rice, pretzel bits, chocolate chips, cookie crunch bits, butterscotch chips and toffee bits. You also can opt for patriotic red, white and blue sprinkles on top. We had quite a debate over whether sprinkles were a good addition or tacky (especially in those July 4 colors, during fall). You can probably guess which camp I was in. While it looks chaotic above, it’s not. The employee scans your ticket when it’s your turn, and you push a lever to release your candy bar base onto the conveyor belt. The bar moves along, underneath the various add-ins. Your name pops up on the LED screen when your bar is underneath. Aside from the pretzel area, the servings were generous. Sadly for our friend who just chose pretzel bits, only 2 popped out onto her bar (my daughter and I only got 3, but at least we had other mix-ins). The woman behind the counter must have realized how sad it looked – or heard us talking about it – and filled hers manually with so many pretzels that the chocolate on top was later bumpy. 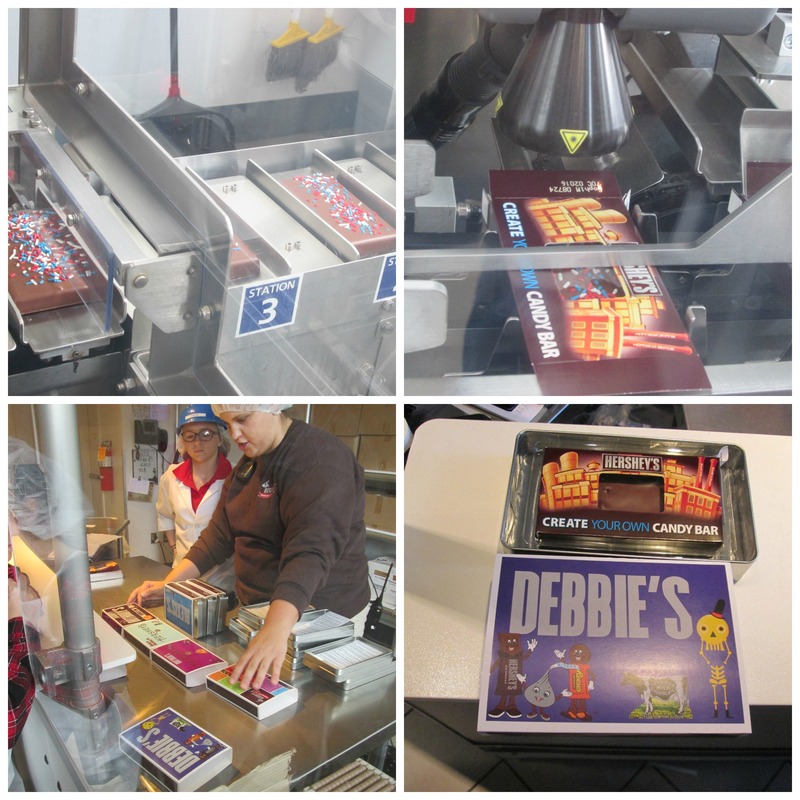 Thank you nice lady, and a note to Hershey – your machine needs to distribute more pretzel bits! 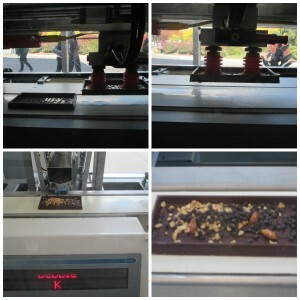 The bar then moves onto the enrober machine, which has constantly flowing chocolate, like a chocolate fountain. I’m not sure why it was running out in such a wide way, when only one bar at a time went through, but presumably they were recycling the chocolate. They had video above the enrober so you could watch the bar get smothered in milk chocolate. As you can see above, the bar comes out looking just like chocolate. It’s still being tracked. It then goes through the sprinkles machine, and drops on sprinkles for those who ordered them. 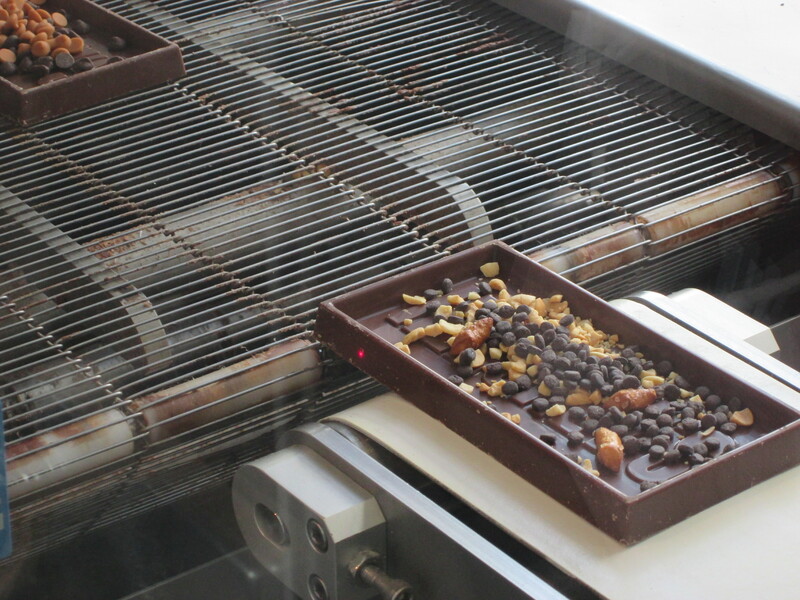 At this point, the bars head into the cooling tunnel, so they can be solid enough for packing. Now you go to the next set of computers to design your label. The label designing was my son’s favorite part of the experience. They have different templates, colors and graphics you can use, dragging and dropping them, and changing their size. It really was fun to make the label. 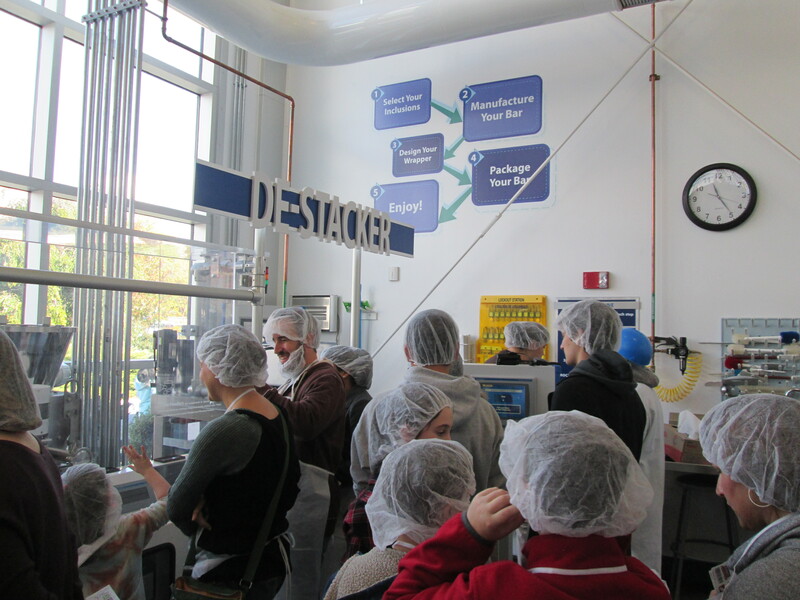 When you’re done, you can get data on how many people chose your combination of ingredients. They also have a production schedule showing when your bar will be ready for boxing. We headed over to the contraption that boxed the bars. They have an electronic display showing which number slot your bar is in. 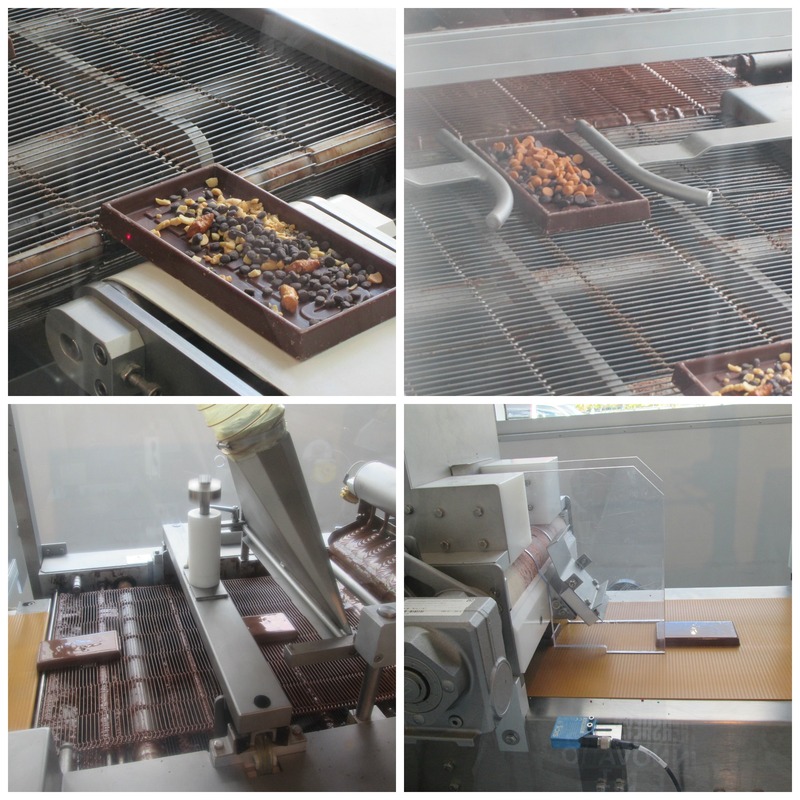 The box gets laser written with some data (see the top right photo), and your label is assembled by hand. 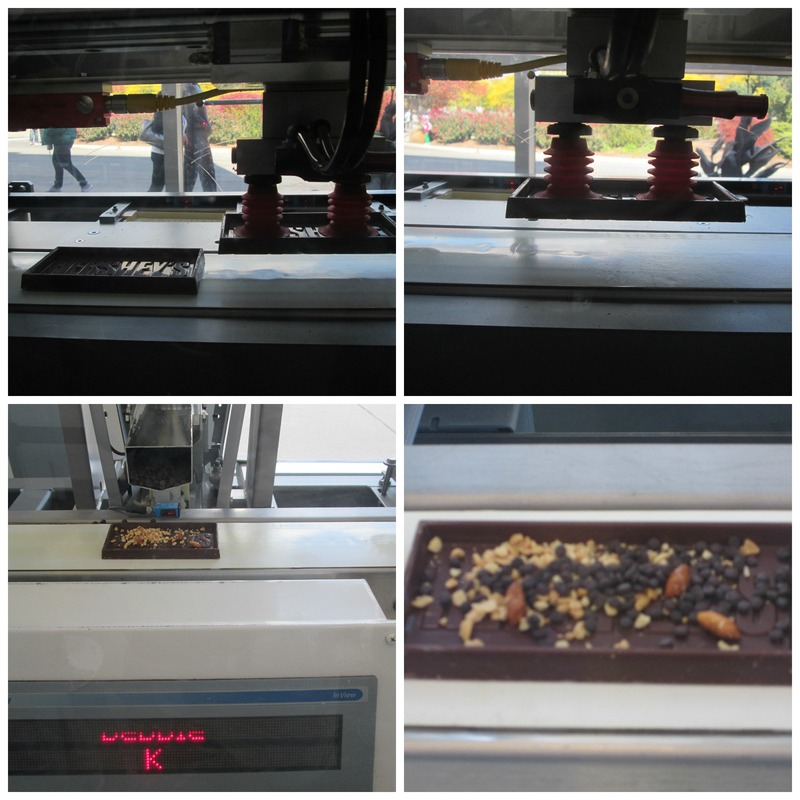 Finally, your bar is pushed into the box and sealed, and it pops over to the manual sorting area. The ladies here put the bar in a metal Hershey’s container, covering it with your fancy label. Voila. You now have a 5+ ounce chocoalte bar to take home! 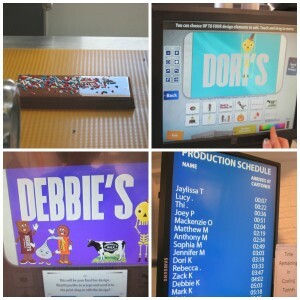 Details: The Create Your Own Candy Bar Experience is a production-line type of program. It’s an assigned time to start, and it takes 30-45 minutes. The bars are kosher. 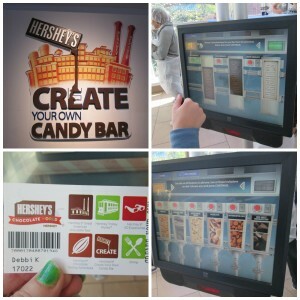 If you buy your tickets online, they are $14.45, and at Chocolate World, they are $15.95. They have more tickets available than you see online. If you buy in advance but don’t like your time, you can try to to switch your time at the desk later (we did that). I was told that mornings generally have availability, but afternoons can sell out. 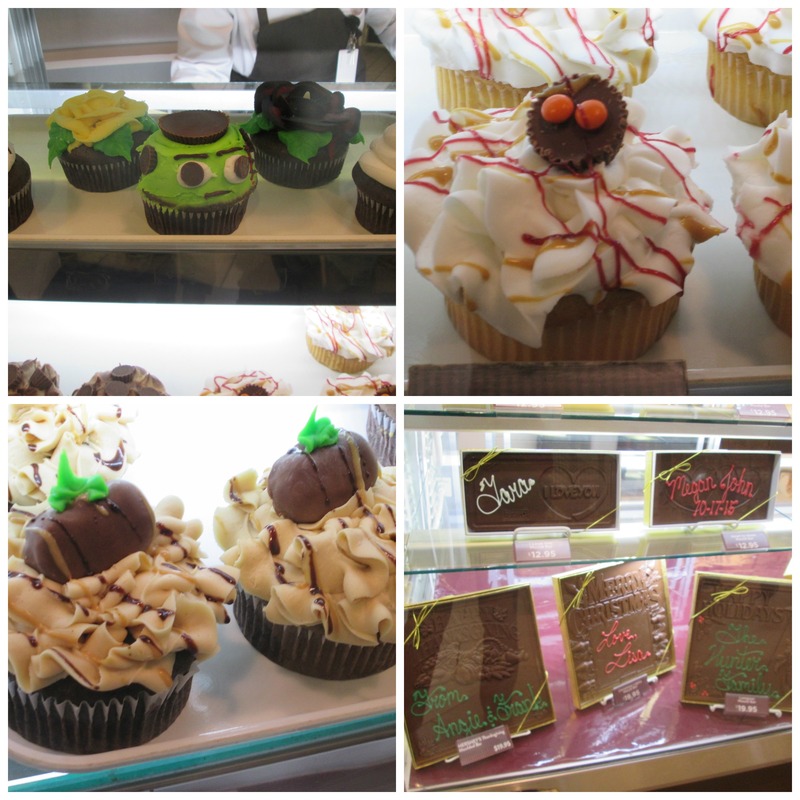 When you leave, you’ll see the bake shop and the custom chocolate area. It’s worth a look! 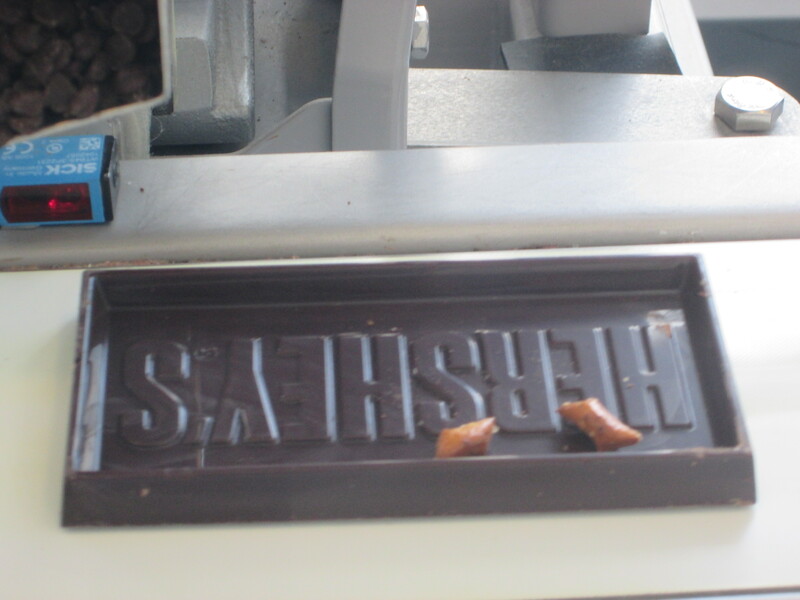 Disclosure: We were guests of Hershey for this experience.